Lions and tigers and bears, oh my. 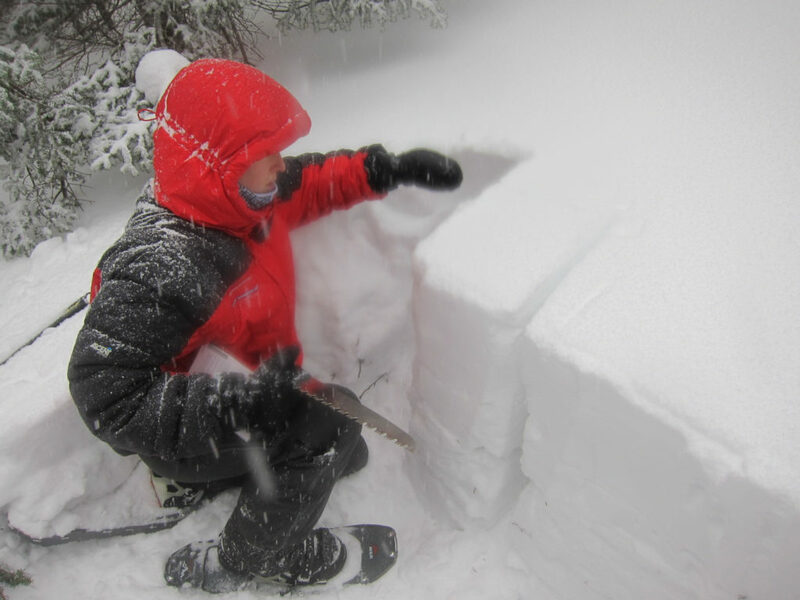 Coming out of winter 2018 I felt comfortable with my basic outdoor competence, even in tough circumstances. A couple of those though were just hairy enough to question not just what I don’t know, but what I don’t know I don’t know. I thought a lot about Kate Matrosova, who died a few years ago in almost exactly the location on Mt Adams at which I I had to emergency bivy in March. She seemed to have the equipment, fitness, and experience needed for her last trip. But, bluntly, she made significant mistakes, like not checking updated weather forecasts, not truly considering the conditions she could expect above treeline, not being equipped for the worst case, and ultimately not turning back in time. 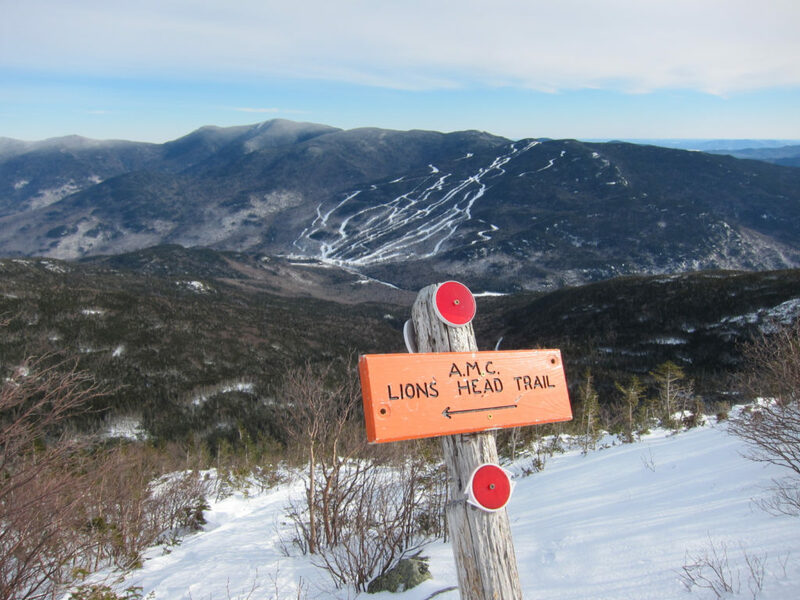 As Ty Gagne discusses in the excellent Where You’ll Find Me, two root problems were: 1) she’d never been on a trip without a guide; and 2) she was not familiar with the White Mountains. She wasn’t used to monitoring her own decision making and mental state, didn’t have experience making critical decisions on her own with no backstop, and didn’t know what she didn’t know about the mountains and weather. I started thinking about the opposite problem: I’ve never been on a guided trip, never taken any kind of formal outdoors training. 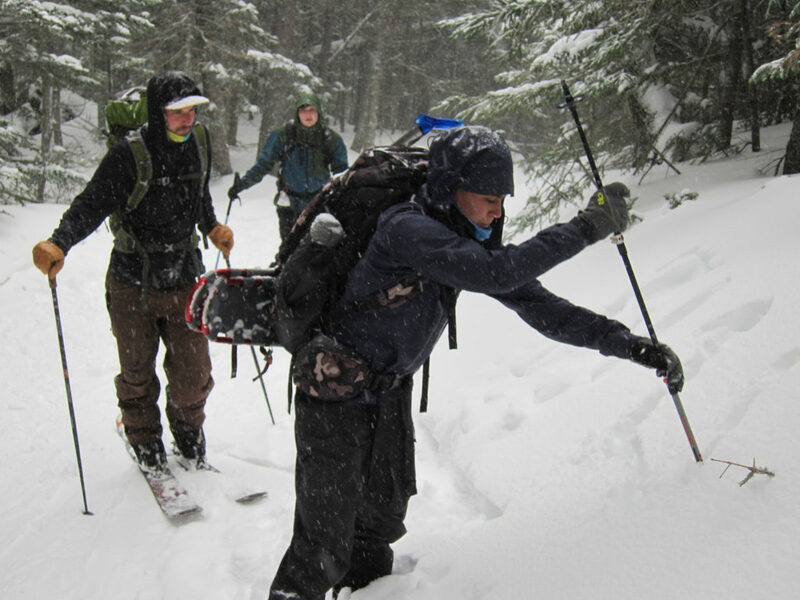 When my buddies and I started getting into the backcountry in college, especially in winter, we just figured things out, read a little, learned from our mistakes—or didn’t. In hindsight we did a lot of dumb things, or failed to do smart things. Years later, with what felt like a good amount of competence but no formal training and not really any more-experienced peers to learn from or check my thinking, was I, am I, being stalked by what I don’t know I don’t know? For example, I knew I didn’t know how to manage avalanches, so I just stayed out of that terrain. But could I actually reliably determine on my own what was avalanche terrain? I didn’t know. At the same time, I had and have a number of new and less experienced people coming out with me. Mostly they had a lot of outdoor experience, but little or nothing like mountaineering in the Whites. Others are completely depending on me not just for their survival when they come outdoors, but for me to come back when I go without them. Everything here is a lot bigger and harder than us. So this season I don’t really have any fitness objective, no target mountain or race. The goal instead is ensured competency. I started rock climbing last spring to work on my core and improve my movement dynamics on steep terrain. In the fall I got NOLS Wilderness First Aid (WFA) certified. Soon I’ll take navigation and other courses. 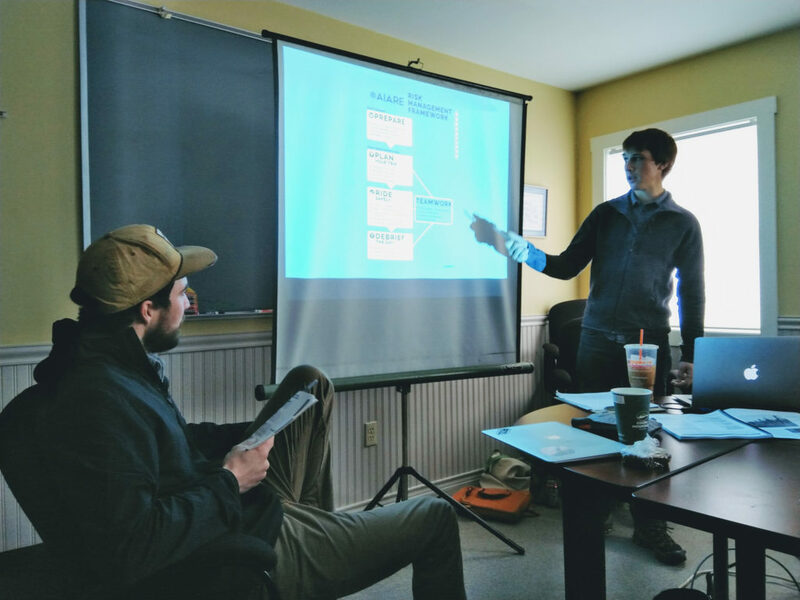 But kicking off 2019 I got certified for AIARE 1, avalanche decision making and rescue, with Synnott Mountain Guides, and it was… Awesome. 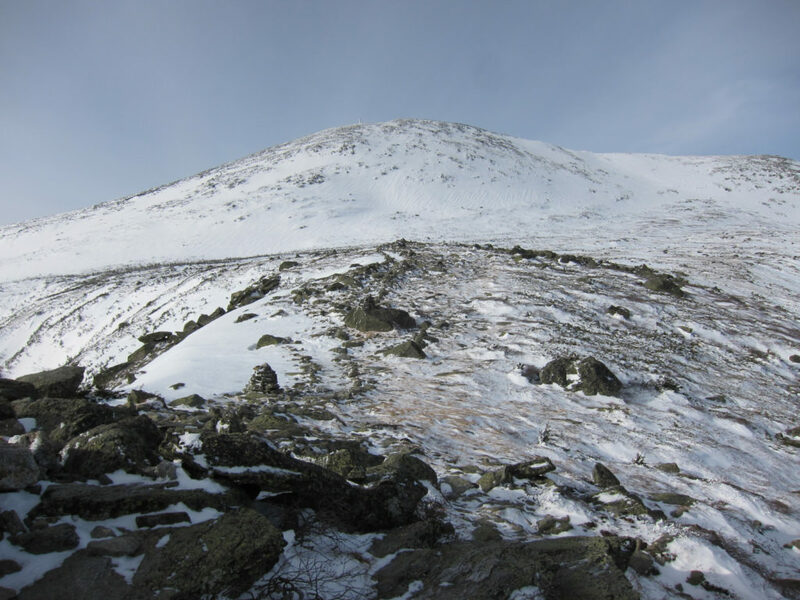 Along the way I also camped out three nights in winter conditions, and had an amazing solo hike up Mt Washington. There are more photos in the Flickr gallery. John going over the plan for the day and avalanche terrain on the mountain. AIARE 1 is the first level of a nationally standardized curriculum and associated framework for avalanche hazard management. There is of course a component on companion rescue, but the focus is very much on decision making. Namely, how to avoid and manage avalanche risk. 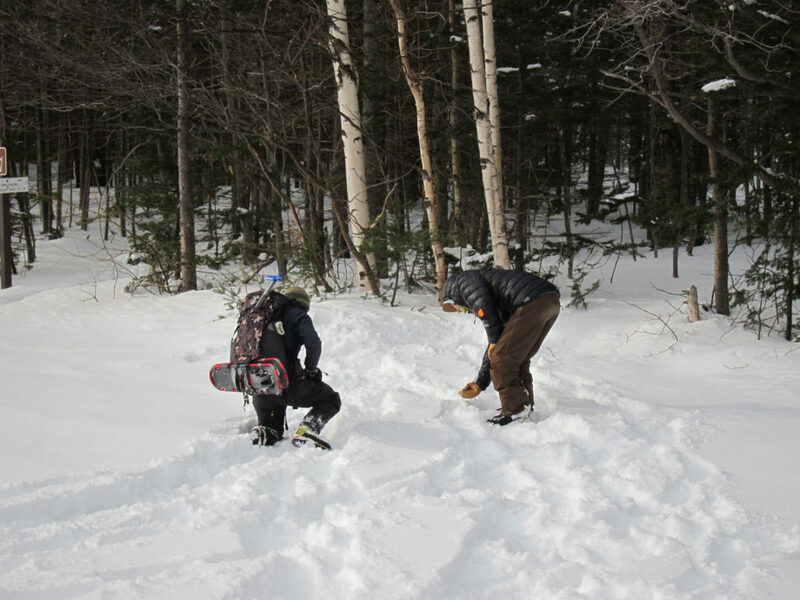 Two field days practicing companion rescue by finding buried beacons as a team, digging snow pits to see snow layering and learn tests to conduct on our own, rehearsing safely moving as a group, and studying actual terrain. I learned a lot from each aspect. 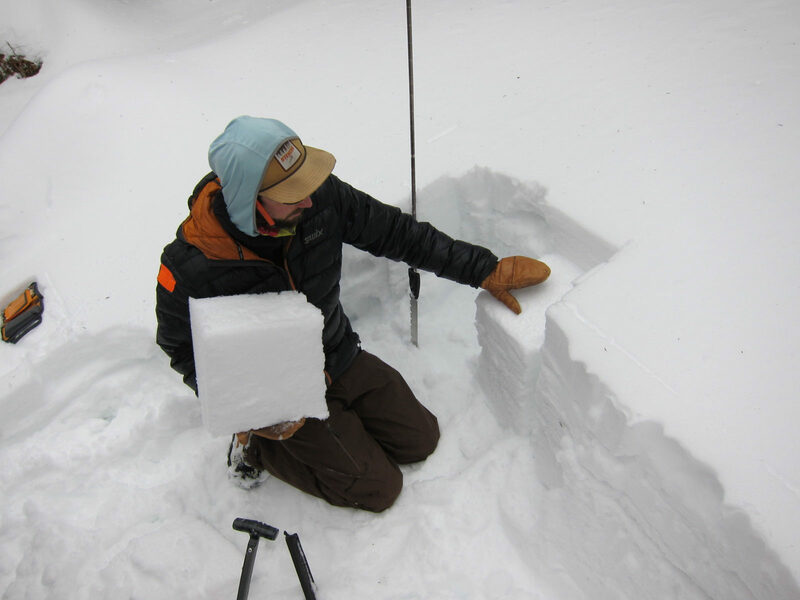 One simple fundamental thing is that it was helpful to me, coming from Philadelphia, to talk about the science of snow layering and then go see it in various locations. I was acquainted with many of the concepts. But coming from a place where snow just melts after a couple days, snowpack is not intuitive. It was a bit alien to think about weak layers being tracked for months and so on, making advisories harder to understand and interpret. Having now both read & discussed concepts as well as gone over them in the field, it all makes a lot more sense. Nick and John introducing the AIARE decision framework. Liza preparing a compression test. Sascha practicing skimming a transceiver the final meters of a search. The way the course is organized, or at least as executed by Synnott, is also a lot more impactful than just reading texts. 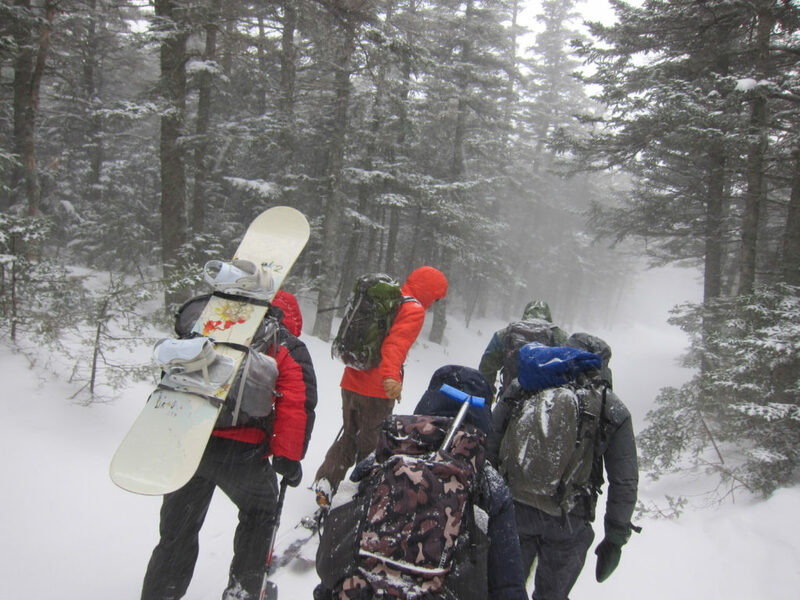 It was fun and light, but Nick, John, and Mark hammered the seriousness of the topic and winter outdoors in general. Again and again it was stressed that this is all about avoiding catastrophic consequences, and not at all about pushing the edge. Some came from relating experiences, like Nick noting in passing that he has frostbite in all ten fingers, or Mark telling about the serious avalanches in which he has been caught. A lot came from the approach and attitude, namely John being extremely clear that, hey, we are going into actual avalanche territory right now, this isn’t an exercise, how do we do this safely? I both enjoyed and learned a lot of intangibles from applying the mission oriented decision framework as a team to plan, adapt, and evaluate each field day’s mini-expedition. 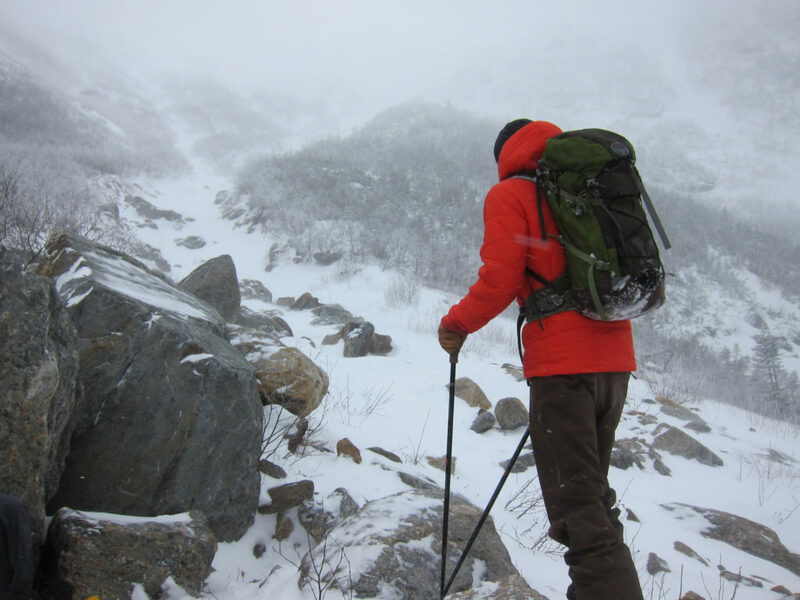 Sure, it felt a bit like overkill, we were “just” heading up into Tuckerman’s Ravine and the Gulf of Slides for a few hours. But that mindset and application—this is the real thing, we have to execute what we’re learning—as well as the value of the course as a whole was brought home and validated by news that at the same time we were in the field, an AIARE 2 course participant in Colorado died in an avalanche. Somebody made a joke early Saturday about how embarrassing for everyone it would be to have an avalanche fatality during the avalanche safety course. But that actually happened just hours later. At some point it’s not a joke, there is always real danger even with comparatively minimal exposure. In the same vein, I almost felt ridiculous toting around my full winter overnight kit for the field days. 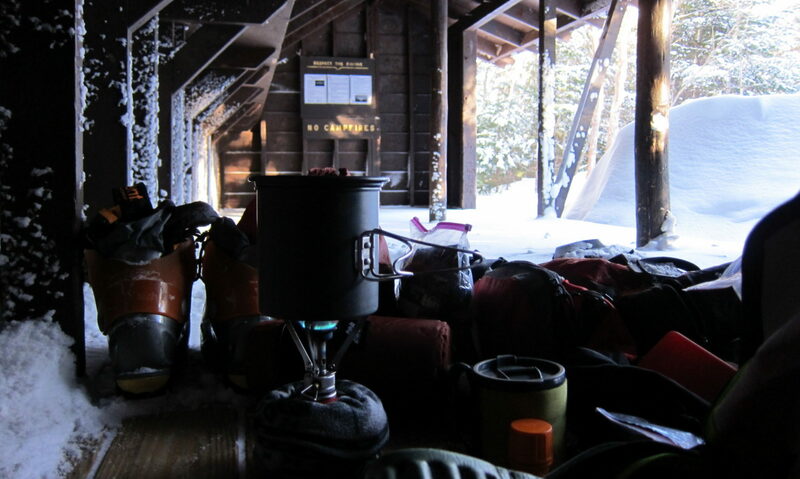 But it’s fairly tight, and for every piece of gear I thought about leaving at the lodge to lighten the load, I could envision and in many cases have experienced exactly a case where we might need it. Sleeping pad? Super helpful for splinting or transporting a broken leg or other major injury. Stove and sleeping bag? Potentially critical if somebody falls into a creek. It doesn’t take much out there to have a real problem, even so close to civilization by miles as is Mt Washington. So I appreciated that our instructors did a good job conveying the magnitude and likelihood of the risks along with how to manage them—how to get out there safely and not simply give up and stay home, but also to do just that when necessary. Sascha checking snowpack levels along the way. John talking about avalanche risks and ascent techniques for Hillman’s Highway. More personally, I did the whole trip Joe-style. Midnight departure from Philly for a 9am course eight hours away (speaking of risk management…). Camping three nights at Hermit Lake. Bonus Mt Washington summit. Starting up the access road from Pinkham Notch the first night, exhausted, was a big mental effort. On the upside, temperatures in the morning were around freezing—practically balmy!—as I hiked down quickly to class. Throughout the weekend I was trying to gauge if it would be worth staying an extra night to go up Mt Washington. On-site, Sunday seemed like a negative indicator. Temperatures dropped into the single digits overnight Saturday-to-Sunday and didn’t get very high in the day. Snow started falling in the morning and picked up throughout the day, as did the winds. But the morning and evening Higher Summits forecasts from the Mt Washington Observatory for Monday were promising: Snow abating and turning to clear skies; big 105mph gusts and steady high winds in the morning, but lessening as the day went on. That gave me some pause, gusts like that can knock over or throw even a laden adult, chancing injury and of extra concern traveling solo. In the end I decided to stay, hoping the forecast would bear out and conditions ease. The last hike up to the Hermit Lake shelters was something. So much snow had accumulated even in the few hours since we came down from class that the huge, unmistakable, snowcat-packed access path took just a bit of care to follow in places, with snow to my ankles and drifts to my knees. 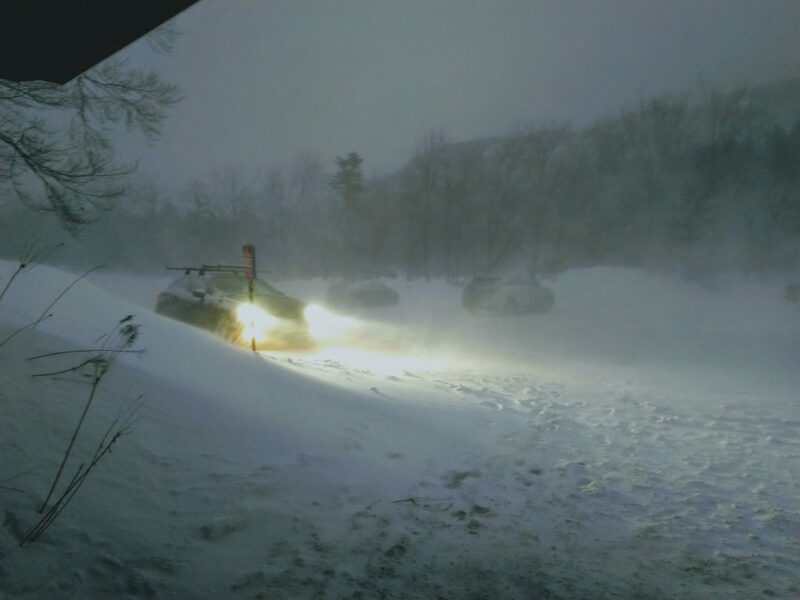 Whether snow was still falling or the wind was just whipping it around I couldn’t tell, but especially in the dark using my headlight it was near whiteout. 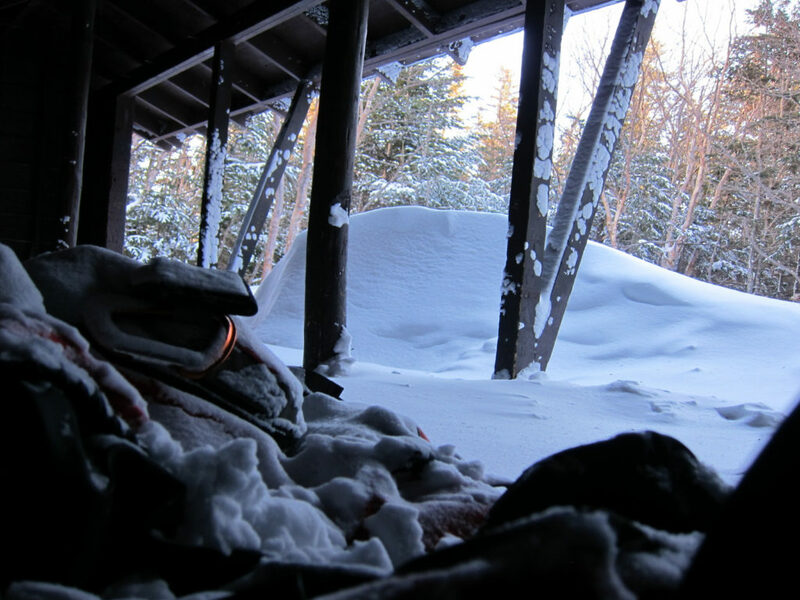 I had to shovel out the shelter and then sleep in my bivy sack inside it to keep the snow off my sleeping bag overnight because there was so much blowing in. Looking out about to head into the storm from the lodge gear room. Hoping to do a quick morning summit and then still drive home Monday, I woke up before dawn. It was obvious though that the winds at elevation were still very strong. I thought about going up and pushing through, but decided not to risk it and went back to sleep. Waking up again later, I was rewarded with bright blue skies and the silence of calm air. Decamping took a while as all my gear was snow covered and temperatures still around 5F. But the somewhat rugged night was well worth the effort: Temperatures warmed up a little, winds above treeline were calm for Mt Washington, the snow was gloriously deep, I only encountered four people the whole day, and you could see everything in every direction. I’ve been really lucky with summit days the past year, and this was among the best. 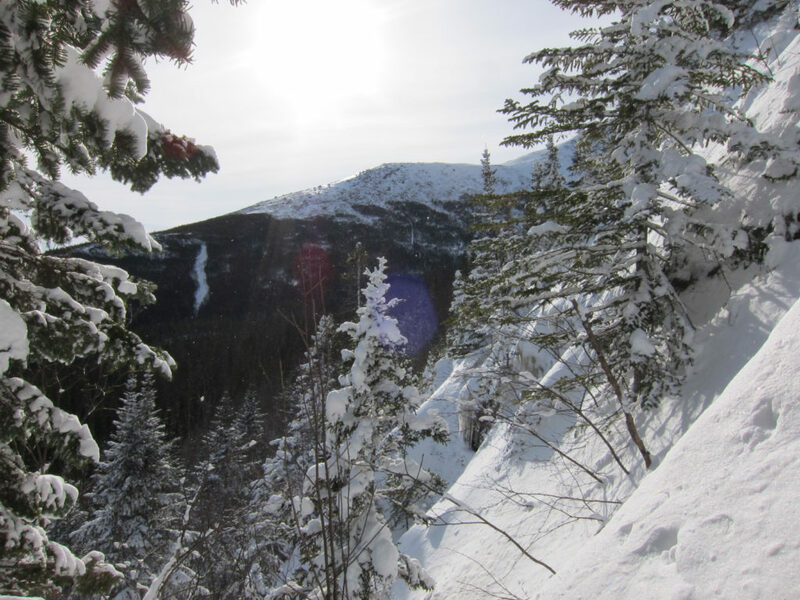 Looking out over Pinkham Notch and Wildcat Mountain just above treeline. The flanks of the summit (just out of sight here). This was a great course and trip. I really liked the people in the class, especially my small group for the field days, and it was fun practicing a formal mission and team oriented mindset. As a side comment, I hadn’t thought about it until a friend asked, but it was good to note that almost half the people in the class were women. 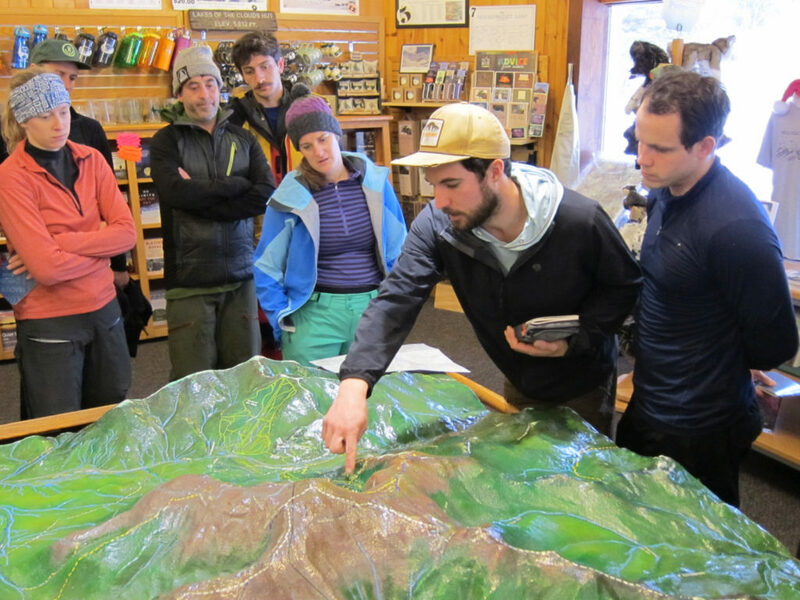 The instructors were very good, both approachable and knowledgeable, serious but having fun, and I definitely recommend Synnott Mountain Guides for this kind of class. I learned a lot. My biggest recommendation for this course is that I’m hoping to do a trip next month outside Whistler in Garibaldi Provincial Park. In many respects it’ll be fairly short and simple, just an overnight and not much mileage or steepness. 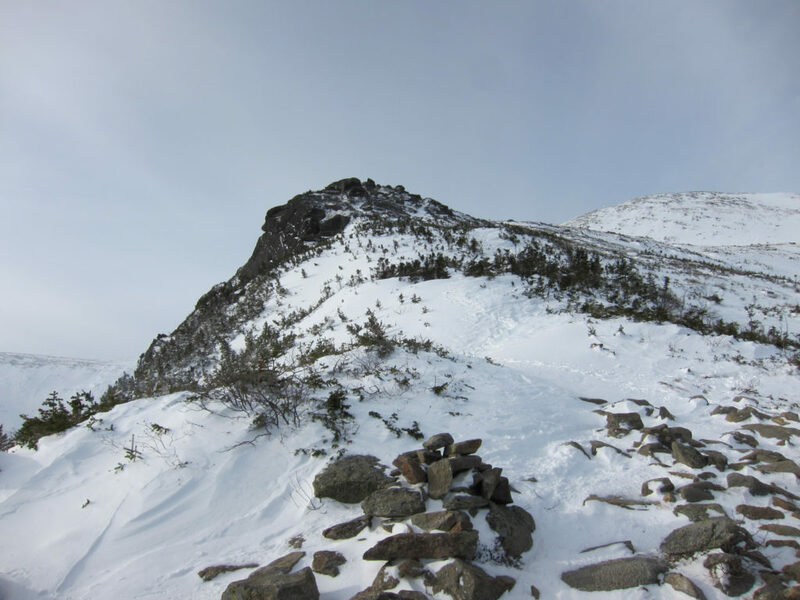 However, there is avalanche terrain and related risks like ridgeline travel with a persistent cornice, and no detailed local avalanche advisories, weather forecasting, or the other infrastructure that exists around Mt Washington and the Whites. I was a bit nervous about it. Coming out of this course though I feel credibly prepared to interpret the regional advisories, estimate and evaluate avalanche conditions on my own, and make good, very conservative, decisions. I know a lot more, and have a little bit better handle on what I might not know I don’t know. This was also a good personal check-in for the top of the year. 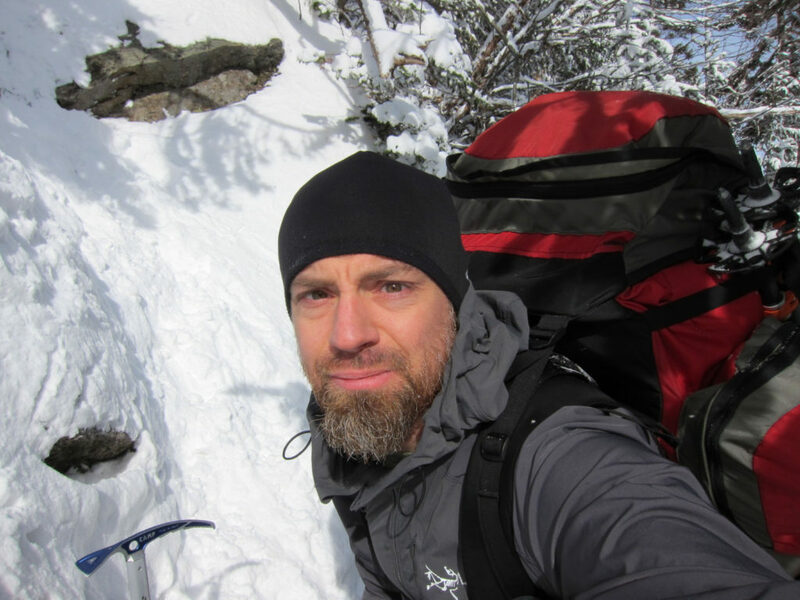 I felt really comfortable physically, mentally, and equipment-wise to hike, hang out, and camp for several winter days. I was a touch worried about fitness as I’m only now getting back to any rigorous workout discipline after breaking my sternum this summer. But I felt good. Looking forward to the year.